Ronn Richard isn't shy about telling anyone why he enjoys leading the Cleveland Foundation. It gives him a chance to help a great region become even greater. That is the goal and theme Ronn has trumpeted since becoming the foundation's president and CEO in 2003 after holding a variety of senior management positions in government, private enterprise, and the nonprofit sector over a 27-year period. Early in his career, Ronn was a U.S. diplomat, serving at the American Consulate General in Osaka/Kobe, Japan and at the U.S. State Department. That colorful background, he believes, positions him well for his current position at the foundation. Diplomacy is key to the collaborative approach that the region needs to solve its problems. Ronn's 13 years at Matsushita Electric (Panasonic) included time spent as head of the company's North American research and development operations, which taught him that great achievement and great learning come only with risk and, sometimes, failure. Immediately prior to joining the foundation, Ronn was the managing director and chief operating officer of In-Q-Tel, the CIA's venture capital fund. In this role, he worked to ensure the prompt and effective delivery of In-Q-Tel-sourced technologies into the U.S. intelligence community. He currently serves on the boards of Ohio Grantmakers Forum, Evergreen Cooperative Corporation, Global Cleveland, NewBridge Cleveland Center for Arts & Technology, LEEDCo, and Living Cities, a national consortium of the country’s largest foundations and financial institutions. 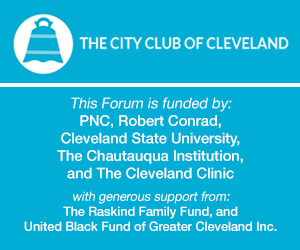 Mr. Richard is board chair of the Cleveland School of Science and Medicine and chairs the Ohio Grantmakers Forum’s task force on educational reform for the state of Ohio. He also is lead director of the board of Emergent Biosolutions, a public biopharmaceutical company. Ronn holds a master's degree in international relations from the Johns Hopkins University School of Advanced International Studies, a bachelor's degree in history from Washington University in St. Louis, and honorary doctorates from Baldwin-Wallace University and Notre Dame College.